We advise that you complete this mini-event ASAP! The event FAQ states that this event will only be live until Friday, November 16th at "12:00:00 PM NST", which technically means NOON, midday. However, the Neocash event packs state that you can activate packs until November 19th, and the retirement date for the NC packs is in December! We're unsure what's a typo, so you should complete this activity ASAP. 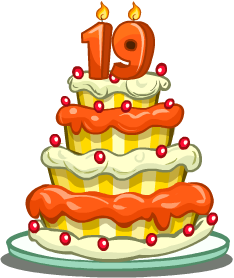 In honor of Neopets' 19th birthday, a birthday party celebration with activities was held on November 15th. This included party games with and an NC Mall component for additional exclusive wearables. All of these events were featured on the Neopets 19th Birthday Celebration hub page. Treasure of the Black Pawkeet is free today and 150NP for the rest of the month. Scores Galore returned on November 13th lasting for 5 days, allowing 5 score sends daily for each flash game on the site. The party hub page had different activities you could participate in to play games and earn prizes. Completing each of the activities awarded an exclusive birthday goodie bag. After activating a pack for a particular activity, you could play it a second time to receive an exclusive Neocash items. You can only receive each NC item once, and you cannot receive doubles.